Elle magazine’s Editor-in-Chief Robbie Myers will moderate a free, public panel discussion on the sexual, economic and emotional lives of women in America. The panel is based off of Rebecca Traister’s new book, All the Single Ladies: Unmarried Women and the Rise of an Independent Nation. 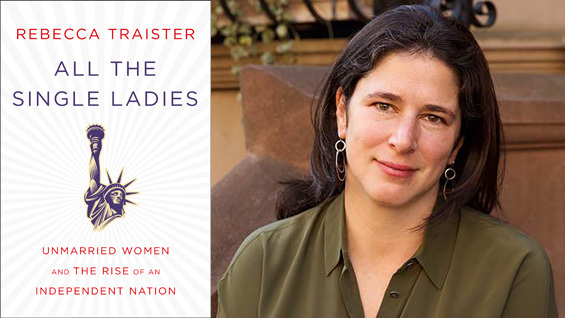 In the book Traister traces the history of unmarried women in America who, through social, political, and economic means, have radically shaped our nation. When Traister began the project in 2009, she thought it would be a work of contemporary journalism about the twenty-first century phenomenon of the American single woman. It was the year the proportion of American women who were married dropped below 50% and the median age of first marriages, which had remained between 20-22 years old for nearly a century (1890–1980), had risen dramatically to 27. But over the course of her research and more than 100 interviews with academics and social scientists and prominent single women, Traister discovered a startling truth: the phenomenon of the single woman in America is not a new one. And historically, when women were given options beyond early heterosexual marriage, the results were massive social change—temperance, abolition, secondary education, and more. All the Single Ladies author Rebecca Traister, a writer at large for New York Magazine and contributing writer for Elle, has made a name for herself writing about women in politics, media and entertainment from a feminist perspective for The New Republic and Salon and as a contributor to The Nation, The New York Observer, The New York Times and more. Dodai Stewart is the Director of Culture Coverage at Fusion, a multi-platform media company launched in 2013. She was previously the deputy editor (and one of the founding editors) at Jezebel.com, and has written for various publications, including Entertainment Weekly, Glamour, The New York Times and more. Jess McIntosh serves as Vice President of Communications for EMILY's List. Before joining EMILY's List, she served as spokesperson for Senator Al Franken through his campaign, recount, subsequent election contest(s), and first year in the Senate. She has also worked in research and communications for the successful campaigns of Manhattan Borough President Scott Stringer and New York City Mayor Michael Bloomberg. Robbie Myers, the editor-in-chief of Elle, moderates. Since Myers became editor-in-chief, Elle has experienced unprecedented success-including a 53% increase in readership-while maintaining its reputation for covering fashion, beauty, culture, and social and political issues from a perspective informed by Myers' commitment to journalistic integrity and bold visual storytelling. Previously, Myers was editor-in-chief of Mirabella. She also held senior editorial positions at InStyle and Seventeen. She started her career at Rolling Stone and worked under Andy Warhol at Interview.